EBS launched its first product, the EBS-1 bass preamp, at the Frankfurt MusikMesse 1988! This marked the birth of a new high end bass amp manufacturer dedicated to making the best bass equipment available. Bo Engberg (b. 1956) grew up in Sollentuna, a suburb north of Stockholm and showed an early talent both in music and selling – he was the number one seller of lottery tickets for the Boy Scouts, which won him a radio! As a teenager he started playing bass in local bands, but also started experimenting with electronics. In the late 1970s, Bo designed and built a series of guitar amps for Swedish guitar dealer and guitarist Jan “Halkan” Hallquisth, and later also a series of effects units for home recording – these were the days of the Portastudio cassette recorder! By then, Mats Kristoffersson (b. 1965) had joined Bo. Mats, who grew up in the village Rimbo, some 60 kilometers north east of Stockholm, has a similar background as a bass player in local bands and a talented electronics designer. Beside making effect units in the Efekt company, the dynamic duo also made a living from installing equipment in concert halls, arenas, recording studios etcetera, but that was just the means to achieve the goal – making the best bass amps available. 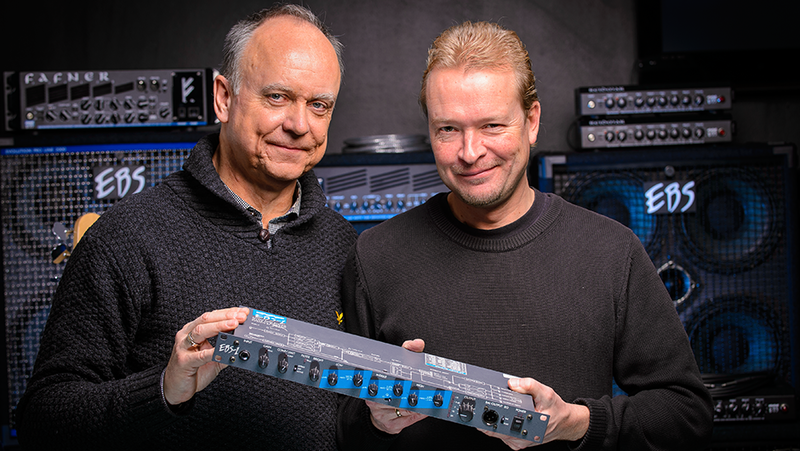 In 1988, the first EBS-1 bass preamp saw the light. Bo and Mats took their new baby to the Frankfurt Musik Messe, in hope of making the music world realize that they were on to something really good for bassists. And luckily enough they ran into an American gentleman in a cowboy hat, Hershel Blankenship, who ran an exclusive business in L.A. assembling advanced electronics rack systems for some of the most prominent concert and recording artists on the American West Coast. Through Blankenship, the first three EBS bass preamps were delivered to three excellent bassists: Flea (Red Hot Chili Peppers), Jimmy Earl (Chick Corea Band), and Billy Talbot (Neil Young & Crazy Horse). Some start, right…? Several well known Nordic bassists joined the EBS roster: John Leven of US chart toppers Europe (“The Final Countdown”), emerging fusion star Jonas Hellborg, session bassist Stefan Brolund, perhaps Sweden´s most recorded bassist at the time, later an Associated Professor at the Swedish Royal College of Music, and Finnish fusion bassist Jan-Olof Strandberg, to mention just a few. And as EBS expanded, international bass artists also became endorsers. In 1993 came the first EBS pedal, the now legendary EBS OctaBass. The steadily increasing line of effects pedals has also made new groups of performers aware of the EBS products – more and more guitarists and keyboard players now go for the EBS sound. Since the mid-1990s, EBS has added several new products to the line: combo amps, beginning with the Taurus 240 in 1993, separate amp heads beginning with the Fafner valve/tube amp in 1996, various new lines of cabinets, amp heads, combo amps, and pedals – most recently the Session series combo amps, the Reidmar lightweight amp head, and the Stanley Clarke and Billy Sheehan signature effects pedals. EBS has its modest but adequate headquarters on the outskirts of Stockholm, manned by Bo and Mats and a small staff of dedicated employees. This is where all the design and development of new products still are performed, as well as quality check before being shipped to distributors in more than 40 countries all over the world. Assembling is outsourced to vendors in Sweden and Asia these days. The list of EBS artist endorsers is as long as your arm and covers styles from hit list pop to progressive, from straight ahead jazz to death metal, from recently discovered talents to seasoned veterans. You’ll see EBS on all sizes of stages in all kinds of genres around the world now. Today EBS range of products include amplifiers, speaker cabinets, pedals, bass strings and various accessories designed by bassists for bassists . EBS pedals has also gained popularity among guitarists and keyboard players in recent years.